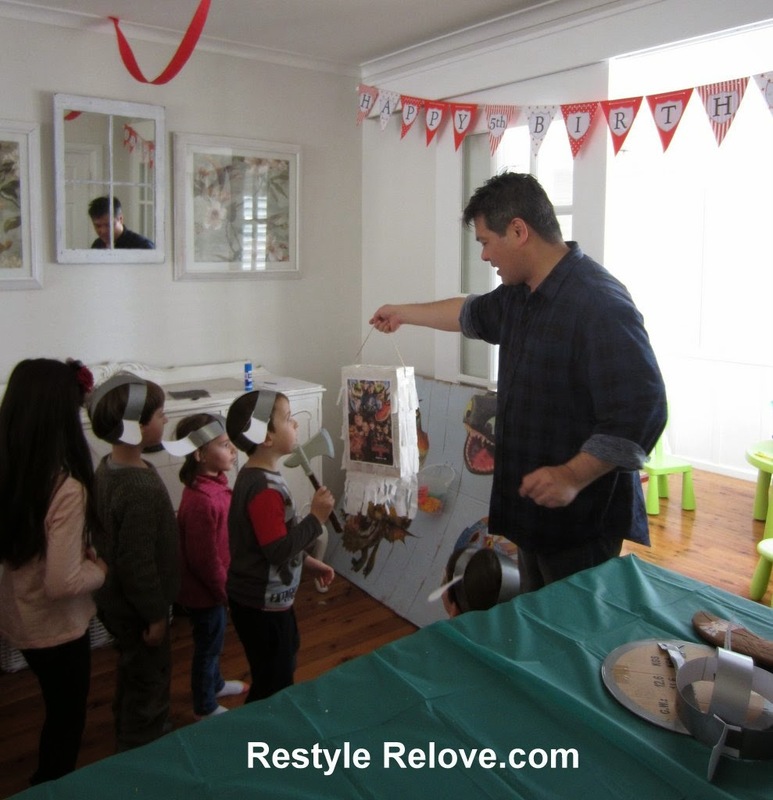 My wonderful little man turned 5 on Sunday and to celebrate I hosted a How to Train Your Dragon 2 Party for him. 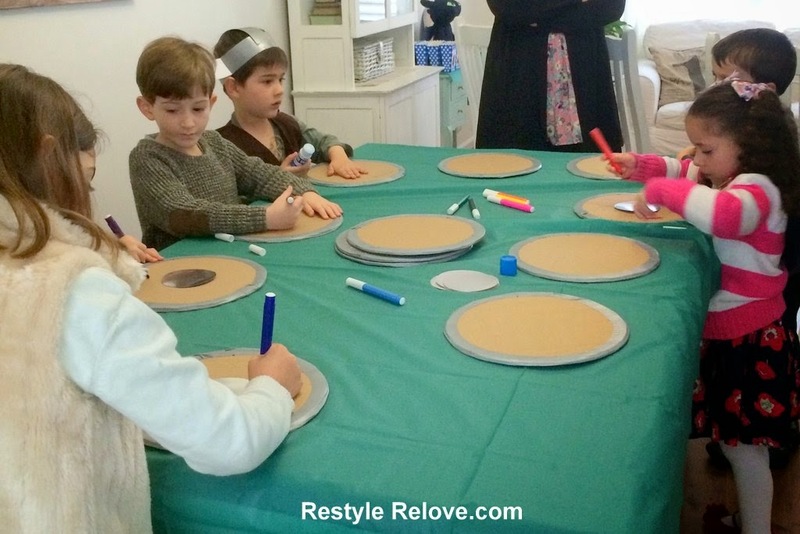 The party was a big hit and as there was a lot of DIY, I thought I'd share some of the games and ideas we used at the party. 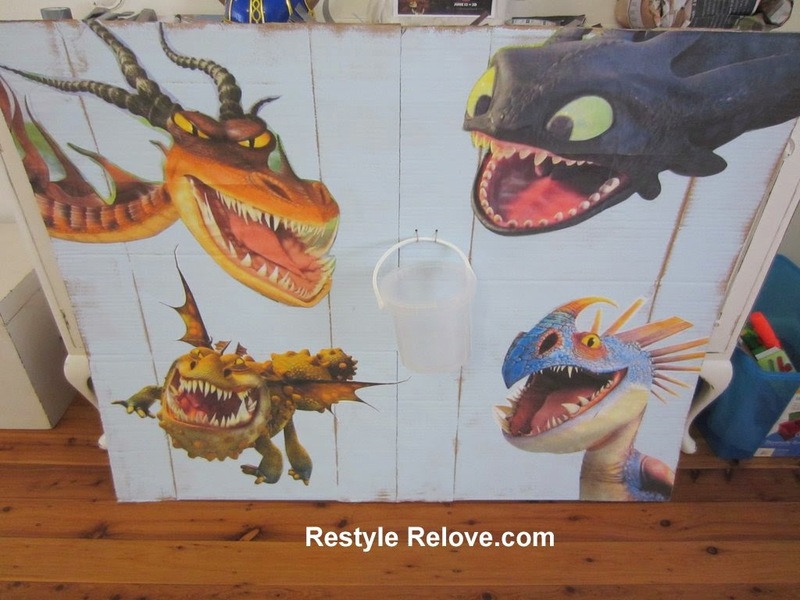 I found a HTTYD party kit download that had printable invitations so we printed them off and filled in the details. Then I backed them with black cardboard and handed them out to his friends. We had to hold the party inside as it was raining. 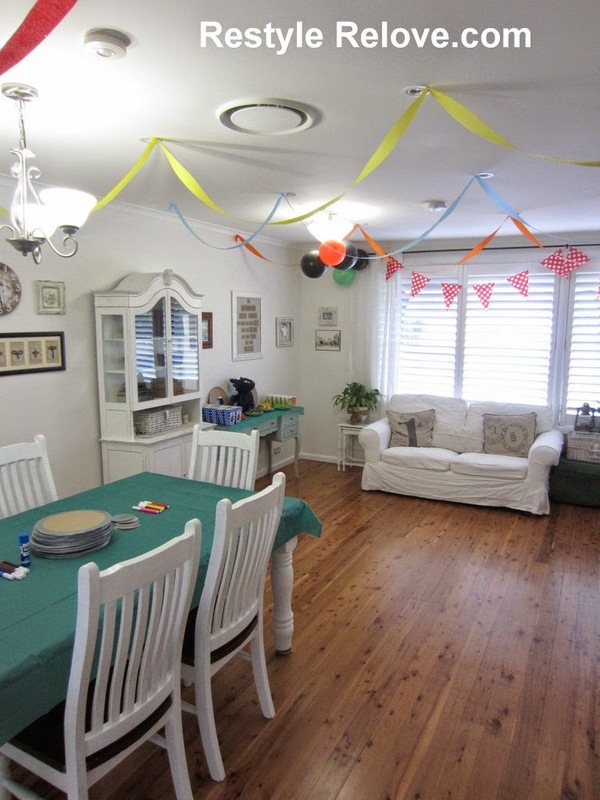 So we moved the furniture and I hung simple streamers and balloons from the ceiling in the HTTYD2 colours. 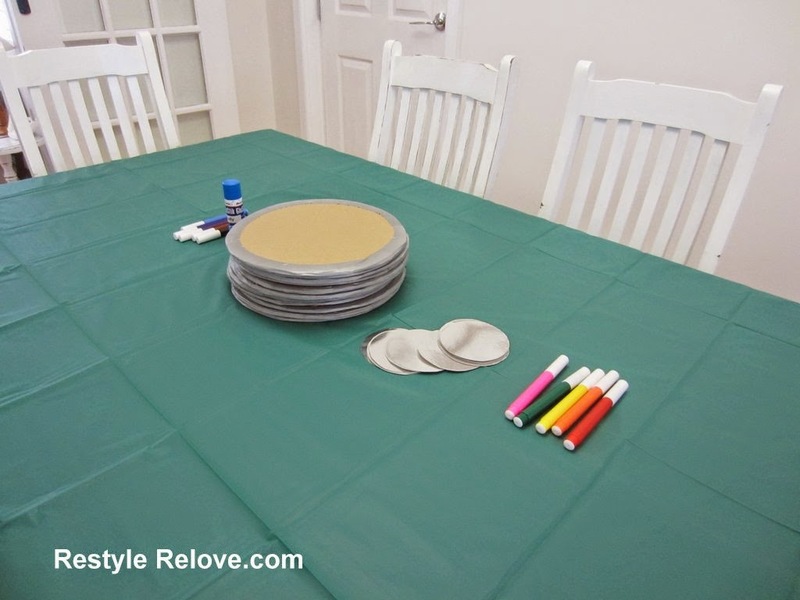 I decided to use our dining table for the crafts so just threw a green plastic table cover over it. I made a personalised viking shield banner saying Happy Birthday and simply printed it off, cut and glued. I enlarged (using Blockposters.com) and printed out large colour images of the dragons and stuck them on a large cardboard box that I simply cut open and laid out flat. The kids helped paint the background blue with a small roller. 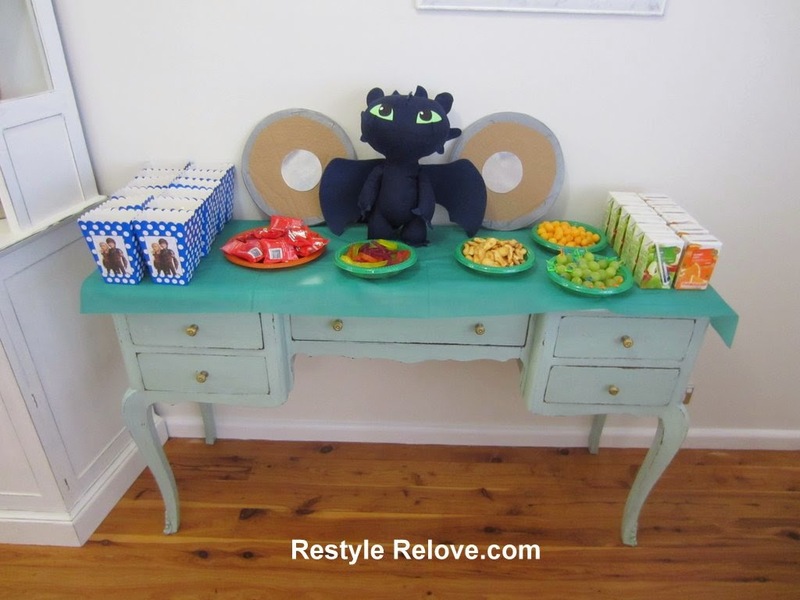 And we had a large stuffed Toothless that I placed on the food table, along with 2 cardboard shields. 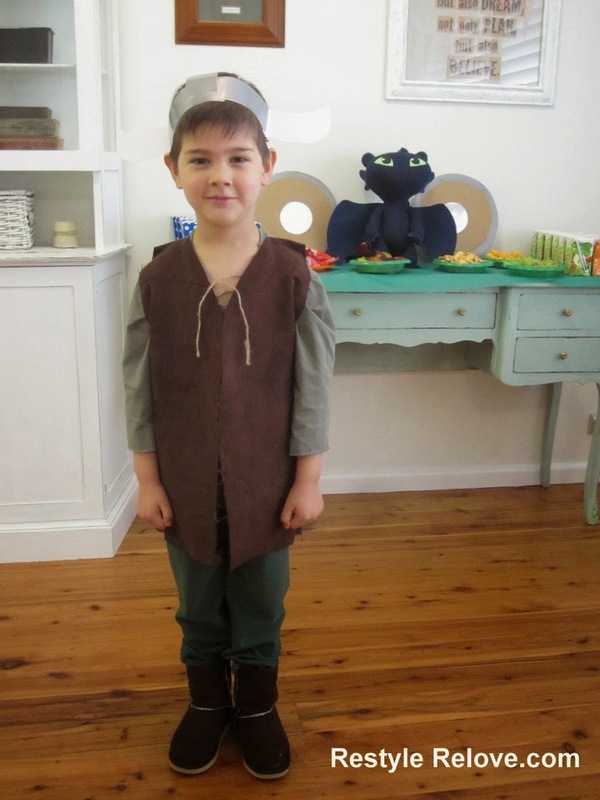 For my son I made him a Hiccup costume. I found a cheap green long sleeve shirt which I cut to his size. Then I poked some holes at the neckline and threaded some twine through as draw strings. I purchased some fabric and sewed his pants and the brown vest. We found the brown boots on sale. 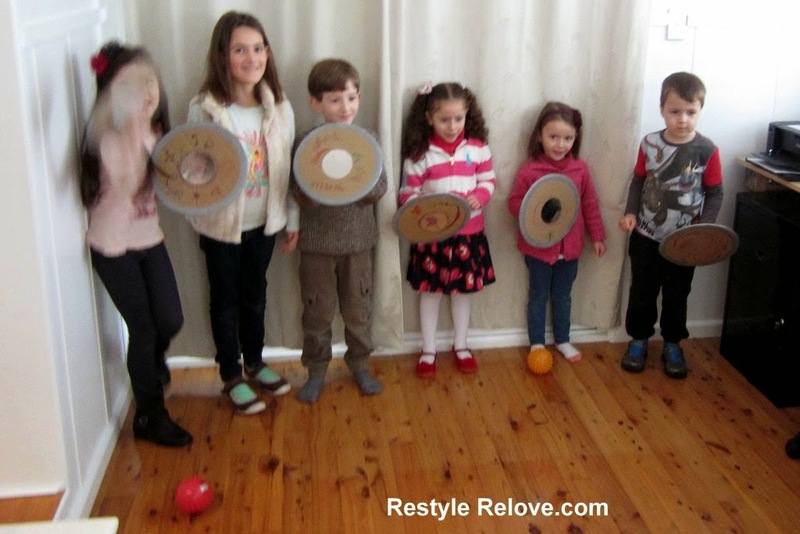 As the kids were arriving I had them decorate a shield each. I had pre-cut the shields from cardboard boxes and just wrapped grey electrical tape around the edges. 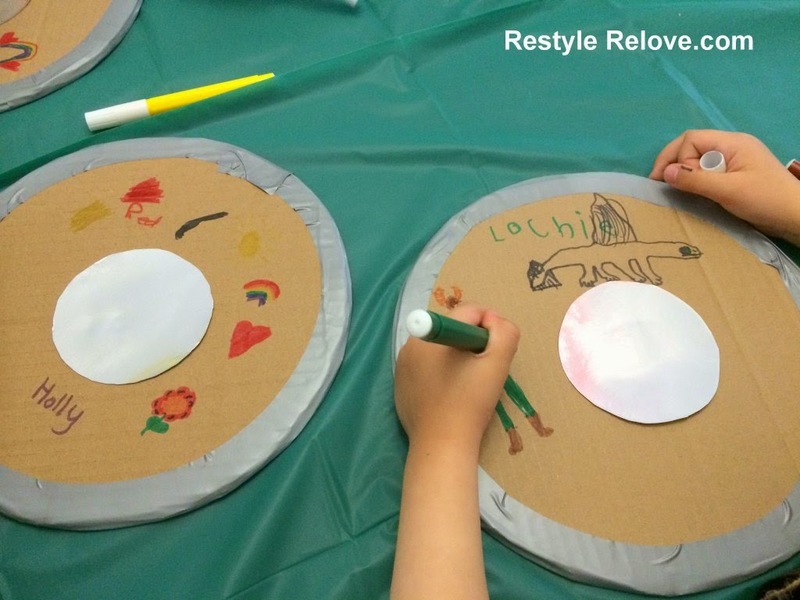 I cut out silver circles for the kids to stick in the centre and gave them coloured textas to decorate their shields with. Then I stuck their handles on the back. I made the handles from strips of cardboard wrapped in electrical tape. 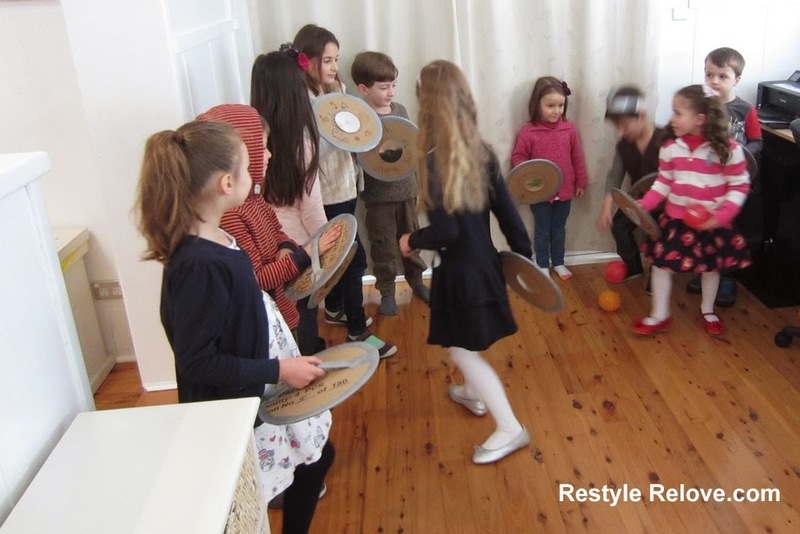 Of course the our vikings needed shield training. :) So I purchased 6 small round spiky plastic balls which were supposed to be dragon fire. We softly threw the balls at their shields so they could practice blocking dragon fire. The kids loved blocking and batting the fire (balls) back at us. I used electrical tape again and taped strips onto a large sheet of cardboard. Then I cut the strips to fit the circumference of the kids heads. I cut smaller strips to fit over the top of their heads, and also used white cardboard to cut out horns. I glued two horns together and folded out the sides. 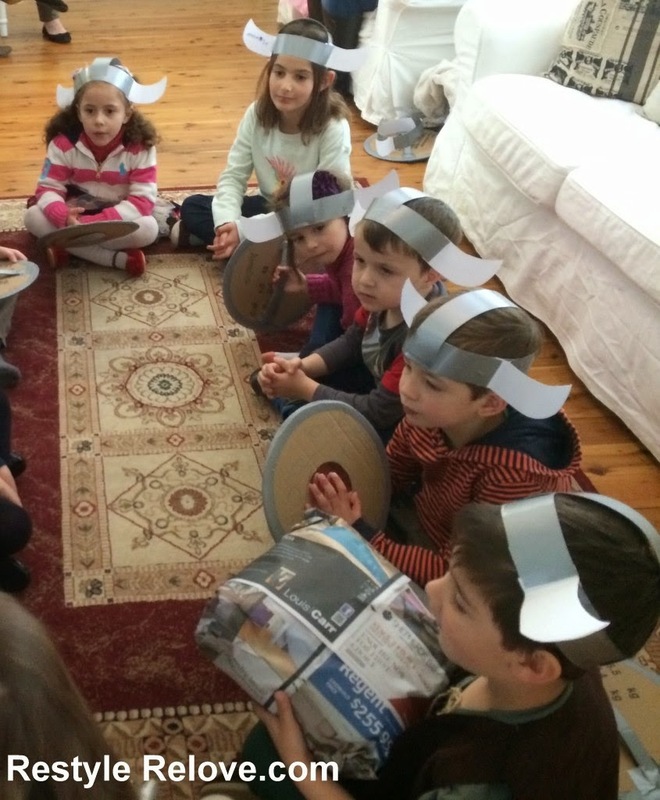 Then we taped everything together with the kids to make their viking hats. 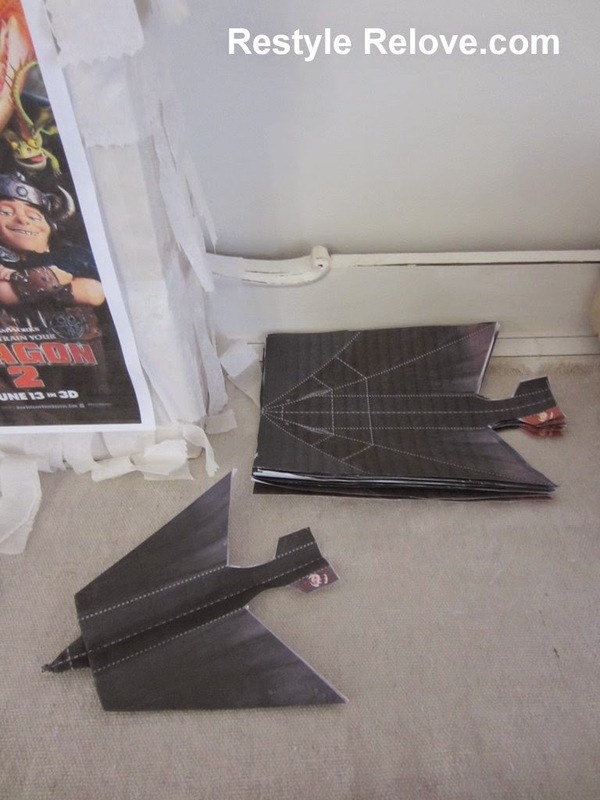 I found a template online for making paper Toothless dragons/ paper planes here. I printed them out in colour and then sat with the kids while we folded them. 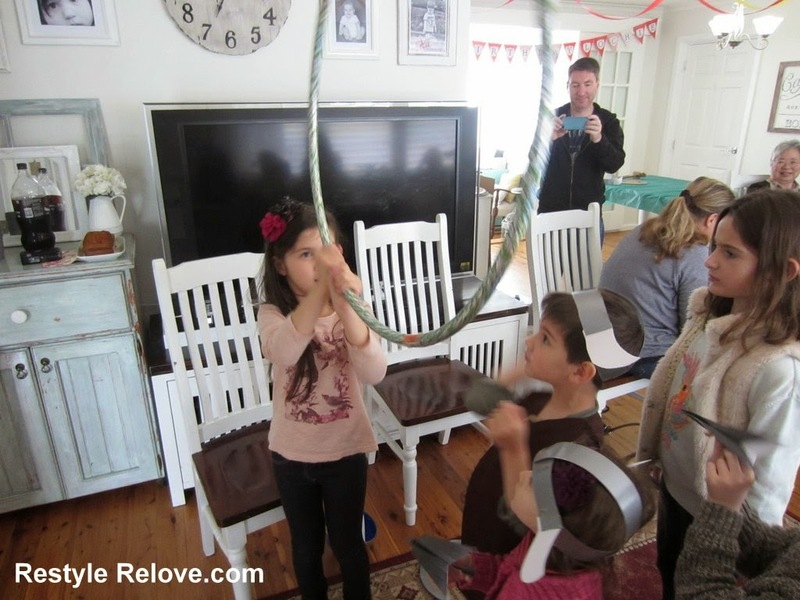 Then we held up a hoola hoop for the kids to aim and fly their dragons through. 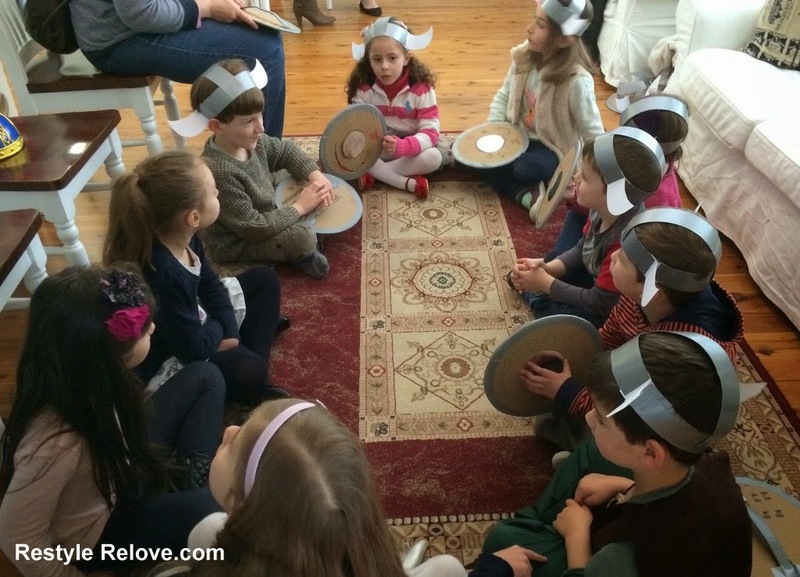 This game is a spin off of Simon Says. 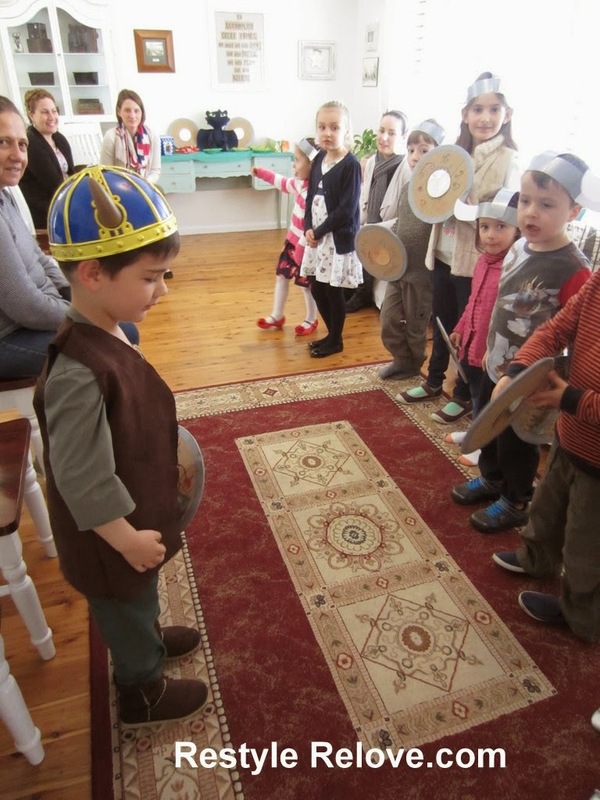 But the person playing the main viking got to wear a special official viking hat. 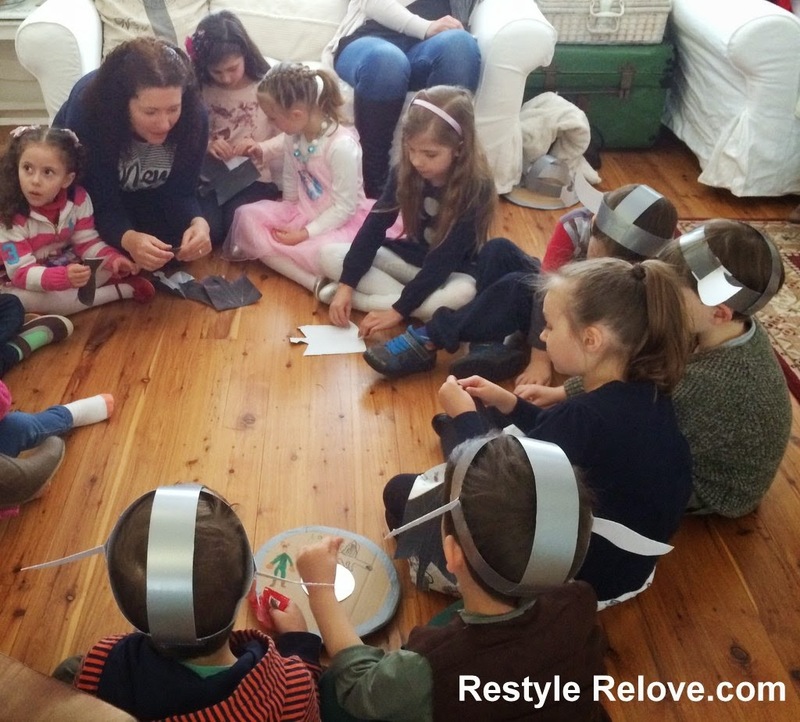 Another spin on Pass the Parcel. I made a paper mache egg a few days earlier with the birthday boy, and he painted it with dragon egg spots. Then I cut the top off and in secret put in a small stuffed Gronkle toy as a surprise. I then wrapped the egg in newspaper. In each layer I had a dragon/dinosaur rubber finger puppet for each child. The birthday boy got to open the egg at the end. I bought 2 packets of toy fishing rods (4 rods in total) and each box came with 6 plastic fish. I think it was $10 for both boxes but money well spent. 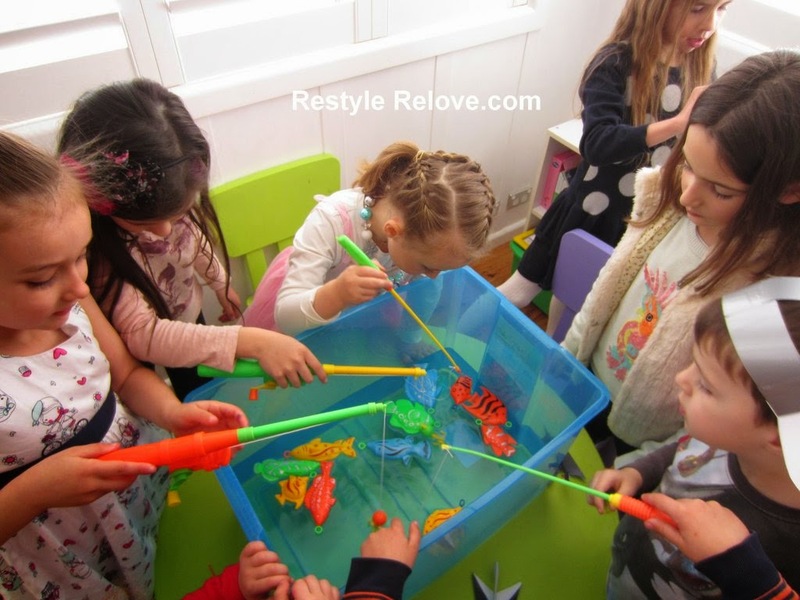 I filled up a toy box with water, put the fish in and each child had a turn catching a fish. Using a cereal box, I wrapped it first with old Christmas paper with the white side facing out. Then I wrapped the box with crepe paper and cut it in strips. 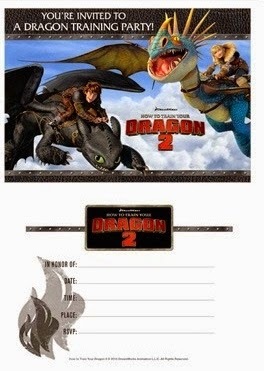 Then I printed a HTTYD2 picture off and stuck it to the front. I filled the box with lollies, added some hanging string to the sides and then taped up the top. My son got an official HTTYD2 toy axe for his birthday which the kids used to smack the box. The kids loved this and everyone got at least 3 turns before it broke. Hubby was the lucky person who got to hold it while the kids whacked. Haha. For the food I had a table for the kids to help themselves throughout the party. 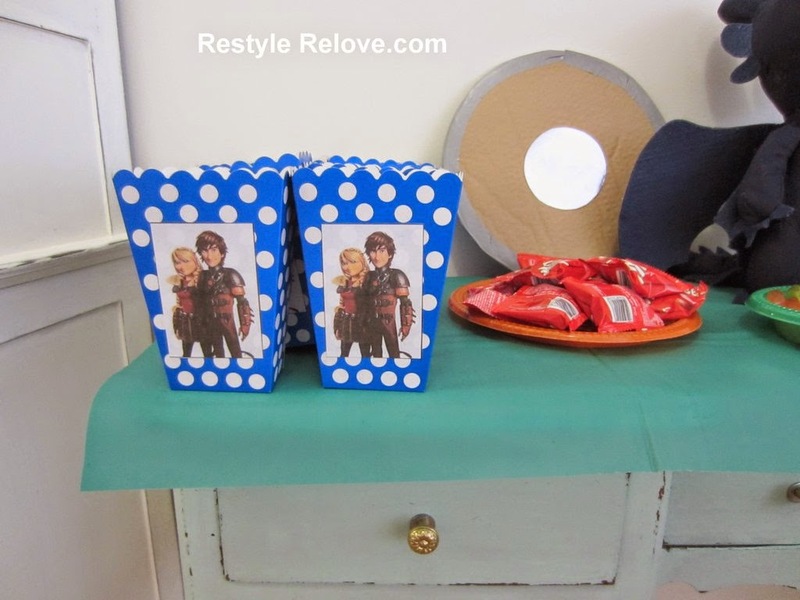 I had boxes of popcorn with HTTYD2 pictures I printed off and stuck on. I had firery cheese balls and Maltesers. Lolly snakes, club shaped drumstick biscuits, and grape swords. For drinks I gave each child a juice popper. For the parents I had a separate little table with coke, water and banana bread. 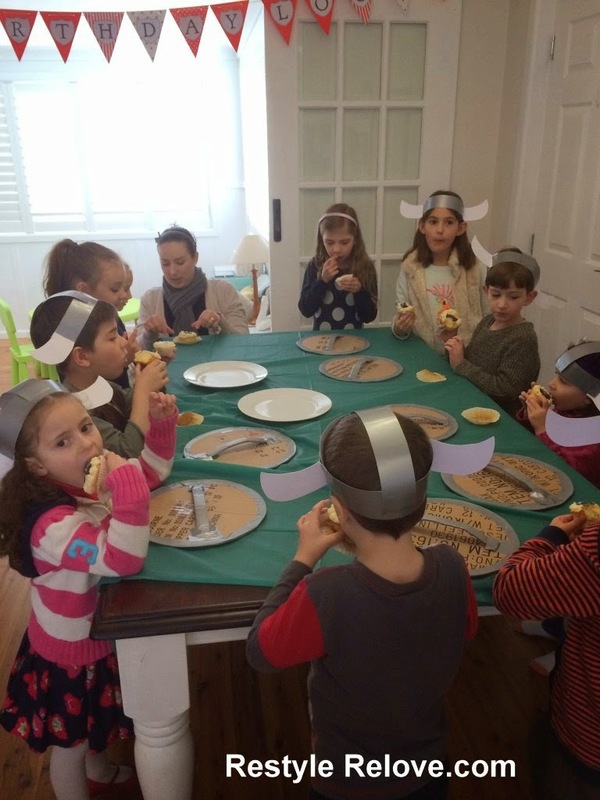 In the first quarter of the party I brought out cupcakes for the kids to eat at the craft/dining table. 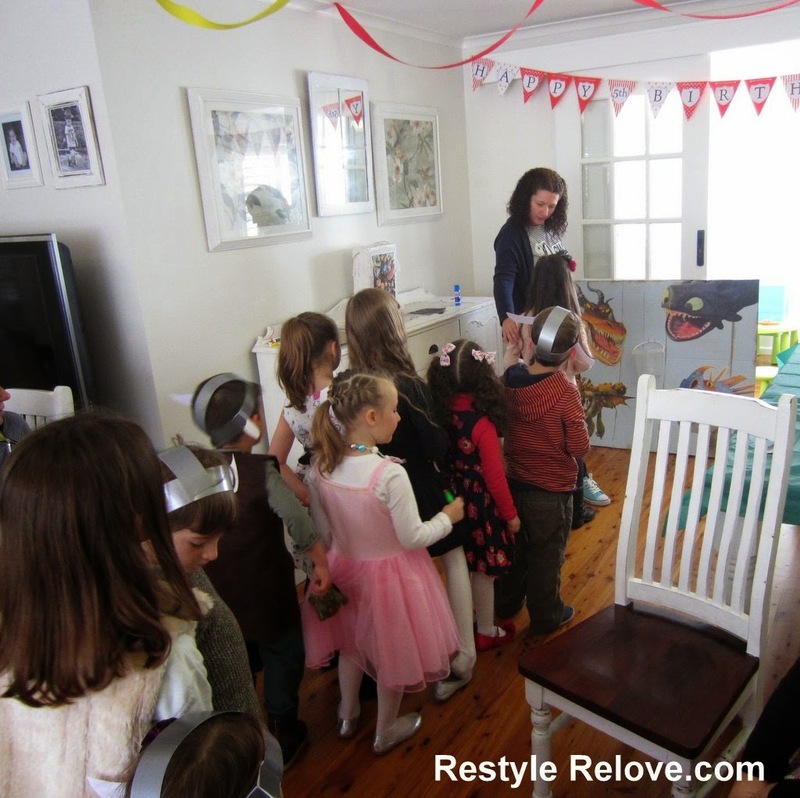 It was too messy to have them carrying them around the house during the party. Then I just swept up the crumbs and carried on with the games. For each cupcake I added a printed icing topper from the movie of the characters that I purchased on ebay. In the middle of the party we brought out warm food of cocktail frankfurts, sausage rolls and mini pies and the kids all sat down and had a sort of picnic. At the end of the party we had the cake. I kept the cake very basic. I made a double layer mud cake with orange icing in the middle. Then used chocolate icing on the outside. 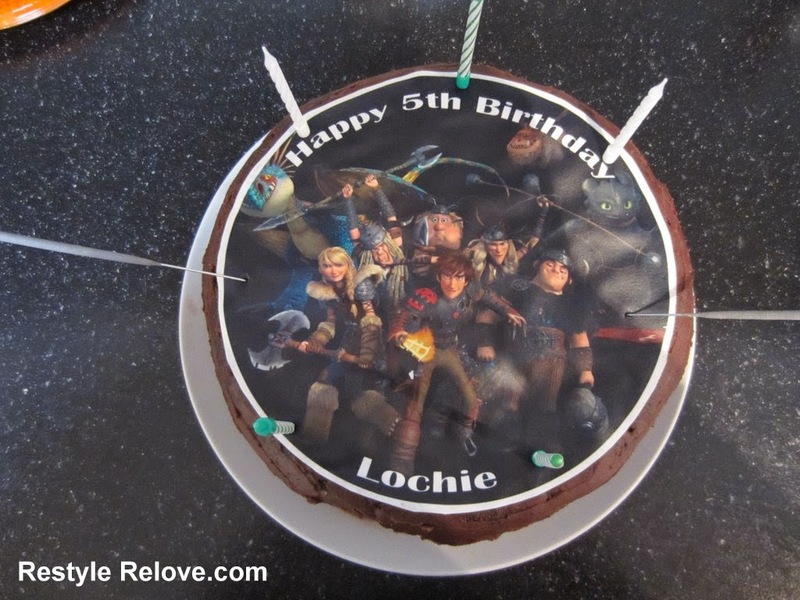 I added a personalised HTTYD2 icing topper to the top of the cake, along with 5 candles and sparklers. 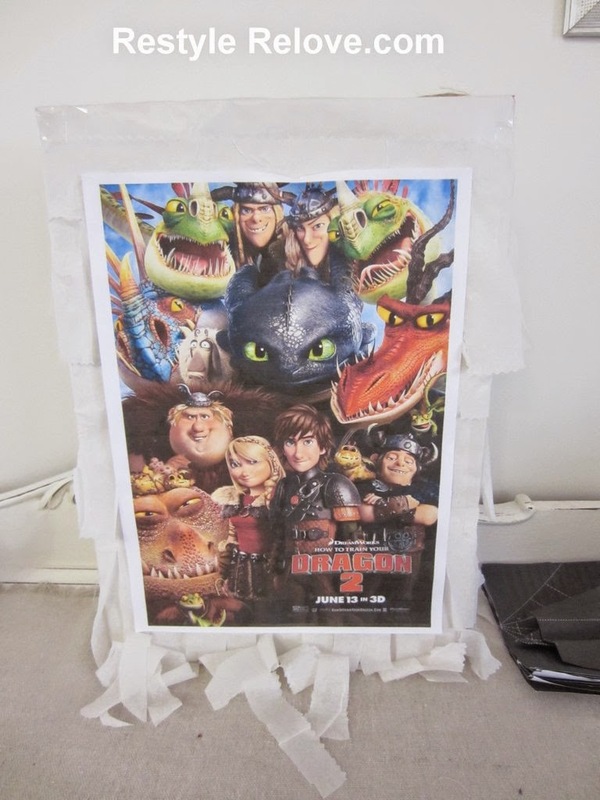 I purchased some blue paper bags, printed out some pictures from the HTTYD2 movie and glued them to the front. 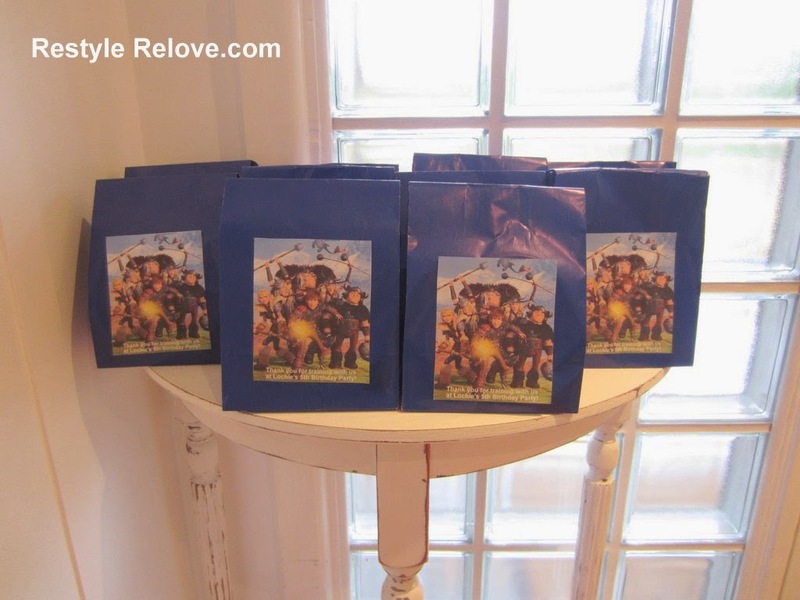 Then I filled the bags with various lollies and chocolates and folded over the tops. The contents were not dragon themed but the bags looked pretty. ;) I placed these on a table by the door for them to collect on the way out. How fun and too sweet. 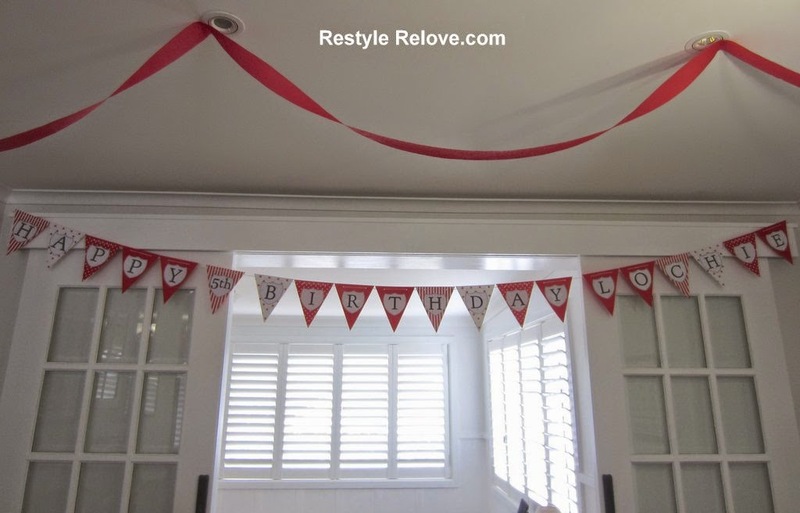 This I bet was such a fun birthday for your son. He is too adorable in his costume. What a great mom you are. The memories you have made for him to remember. So sweet. Adorable. Where did you get the large dragon images on your cardboard sign?